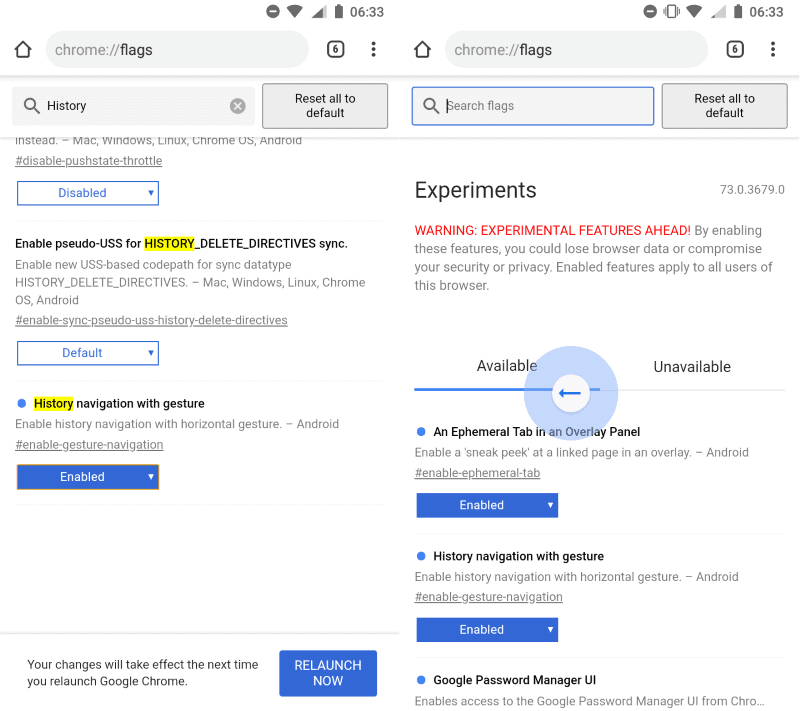 Google has been working on a new feature for Google Chrome for Android for a while that adds options to the mobile browser to go back and forward in history by using gestures. Swipe from the left to go back in history or from the right to go forward. The main idea behind introducing gesture based navigation options is that it provides users with one-hand control over the process. Google Chrome does not display back and forward buttons on Android in the main user interface. Users may activate the back button of the Android device to go back a page, or open Menu to select the Forward button instead. One issue that arises from back button usage is that Chrome will close when you hit the back button if there is no page in history to go to. Chrome for Android does not indicate that. Google implemented gesture-based navigation of the history in Chrome Canary for Android. The feature is hidden behind an experimental flag at this point in time. Experimental means that it may find its way into Chrome at one point in time, or that it is pulled by Google again. Make sure that Chrome Canary is up to date. Load chrome://flags in the address bar of the browser. Search for History navigation with gesture. Set the experimental flag to Enabled. Restart the Chrome browser with a tap on the Restart button. Once restarted, swipe to the left or to the right to go back or forward. Chrome displays an overlay icon that indicates the process to the user. The only option to cancel the process is to keep the finger pressed on the screen and swipe to the left or right screen border. The icon disappears when that is done and Chrome won't go back or forward in history. Google Chrome for Android supports other gestures already. Users may swipe down on a page to display the list of tabs open in the mobile browser. Now you: which mobile browser do you use? Does it support gestures? I use Boat, as it’s the least-worst of the mobile browsers I’ve tried. I does support gestures, but I don’t use them (I don’t find them useful on the whole) so I couldn’t say how well they work. I hate gestures. Give me soft buttons.